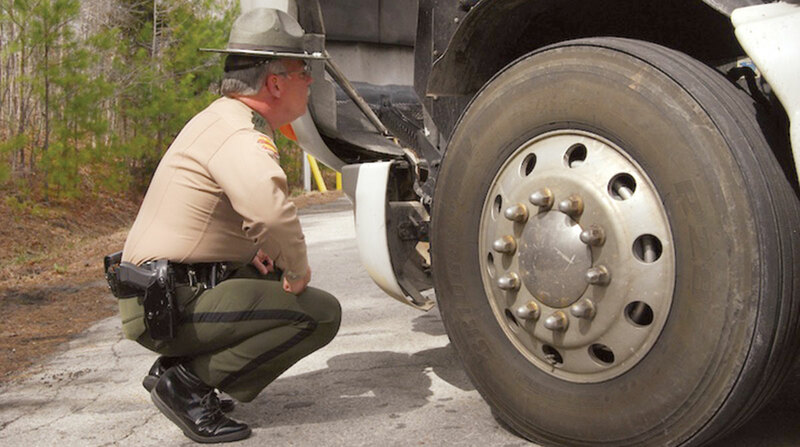 Ensuring that thorough tire inspections are part of every pre-trip checklist can extend tire life and help ensure that truck drivers make it to their destinations safely, tire experts said. “Proactive tire maintenance is foundational to helping fleet owners maximize uptime,” said Ron Greenleaf, director of sales for the western zone at GCR Tires and Service, a division of Bridgestone Americas. Green added that drivers should always use a properly calibrated tire-pressure gauge when checking inflation levels and not rely on the tire’s appearance. Evan Perrow, senior product marketing manager, commercial tires at Goodyear, noted that inflation levels should be checked at least once a week — more often, if possible. “Maintaining correct inflation pressure is one of the most important maintenance practices that a fleet can employ to positively impact casing life and overall tire performance,” Perrow said. Factors beyond inflation can also affect the life of a tire casing and a tire’s longevity, so visual tire inspections are also “very important,” Schroeder said. “Drivers should look for damage to a tire’s tread and sidewall area,” he said, noting that tires with bulges or cuts in the sidewall should be taken out of service and carefully inspected. He added that tires used in delivery or urban settings with curbs and other potential obstacles should be checked every day. Goodyear’s Perrow added that visual tire inspections should include checks for “unusual wear patterns,” such as cupping and feathering. Cupping refers to cup-like indentations in the tread due to imbalance, while feathering refers to a tapering off of tread depth on one side or the other because of improper alignment. “If detected early enough, these conditions can be countered or corrected to help extend tire life,” he said. A daily tire pressure check can prevent under- or over-inflation, either of which can cause uneven wear and casing damage, Greenleaf said. “This damage can make a casing unfit for retreading, preventing a fleet from capitalizing on that casing’s full performance and cost-savings potential,” he said. Michelin’s Green added that if damage or wear exposes the steel plies, the tire’s integrity is compromised and it must be removed immediately. All of these guidelines apply to every tire position, said Tim Phillips, vice president of marketing and operations for CMA and Double Coin. He noted that the best way to ensure proper air pressure is being used is to scale the vehicle when loaded by axle, which will provide exactly how much load is over each axle. “Once you have that information, consult any manufacturer’s data book to find an air pressure table and just match up the load with recommended PSI,” he said, noting this ensures there is not too much or too little pressure in a tire. “Tires that are over or under inflated need to be corrected to the proper operating pressure, including the all trailer positions,” he said.